Happy Holidays! 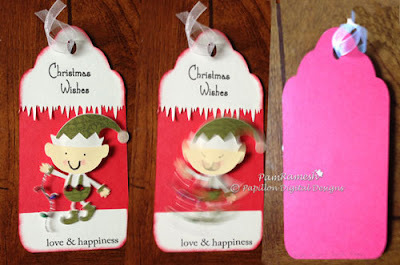 This is Jeannie from NonnasScraps. I am so pleased to be with you today! Last year I gifted all of my fellow teachers with Post-it Note holders. They not only loved them then, but have asked me repeatedly for the same gift this year. I saw a photo of an easel holder somewhere (sorry...old age!) and it has been at the forefront of my thoughts. Voila! Teacher's gift meet easel! Fold 1 1/2" of ribbon in half. Center on the back of the inside mat (3 1/4" square). 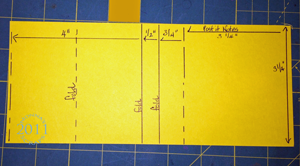 Glue inner mat onto backing as indicated above by "Post-it Notes". Fold as pictured above. 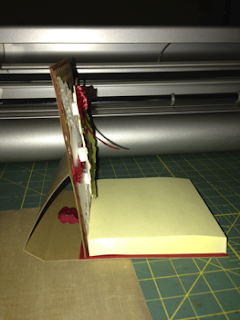 This is the inside of the holder. 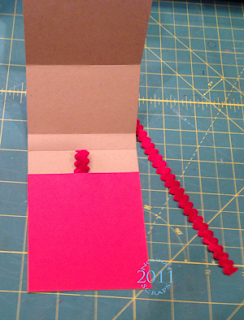 Glue the Post-it notes to the red mat. Complete front by layering the front mats. Glue the layered mats to the lower half of the front. The easel sits behind the notes. Slide the miniature pen into the ribbon holder and gift! I hope you enjoy making this as much as I did! I do not want to forget that the background paper in my main photo is from ScrapGirls Christmas Candy collection. Check out their amazing digital Holiday Collections...and happy holidays to all! Posted by Jeannie at 1:00 AM 4 "kind encouraging and inspiring words"
Posted by Unknown at 1:11 PM 4 "kind encouraging and inspiring words"
Posted by Dk at 10:03 AM 3 "kind encouraging and inspiring words"
Sheila from http://shesasassylady.blogspot.com/ and myself ie from http://www.thebugbytes.com/ decided to hold a tag swap for Christmas for both our designers ( in US only this time). 15 took part including Sheila and myself. Now to the eye candy part - Here are the tags which came to me. Since Sheila has been a little busy she did the communicating role and I did the shipping part of it. So I should say I saw all the tags first :) :). Yeah! You should have seen me shouting with joy as each box came home. Yep I did dance a jig when each one came. Couldn't wait for the last ones to come home to mama. I did not send emails back to the last few I got as I sneaked to post office posted them and dint mention I did so as to surprise them all ooh was it worth it! when I got the first excited email!!! What fun!! 4) Elizabeth aka makeupgirl217 from http://217creations.blogspot.com/ sent this tim holtzy tag. The background is canvas. 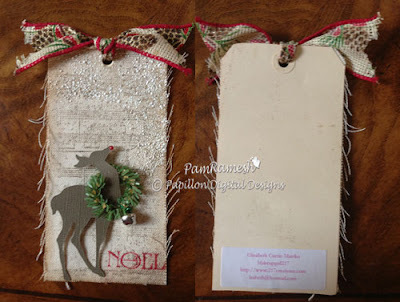 Love the texture on this one and the way she weaved the wreath/garland around the reindeer's neck. And the jingle bell. Love it! 5) Melissa from http://melissamade2.blogspot.com/ sent this lovely colored tag. It is a flapped tag so that we can add a message inside. Love that reindeer with that big nose. Cute!. I also got a cute colored card in the box she sent me. How sweet! 6) Michelle - http://ladyofleisureink.blogspot.com/ sent this wonderful tag. 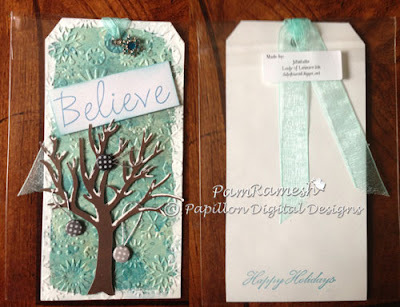 Love that blue colors and the candy dots on the tree as ornaments and the snow texture. Awesome. She also sent me a very pretty card. 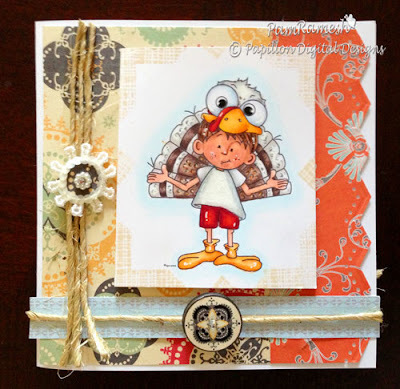 I will share the card on another post along with Melissa's lovely card. I tell you I have seen our designer's work on the blog but they do not come close to seeing, holding and touching their wonderful creations in person!! 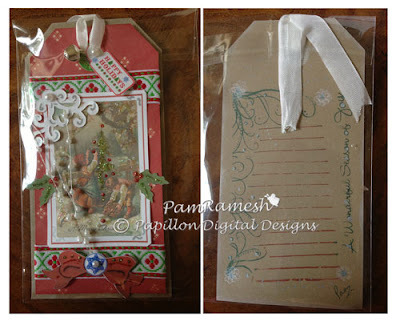 7) Here is Jeannie 's - http://nonnasscraps.blogspot.com/ Beautiful tag. 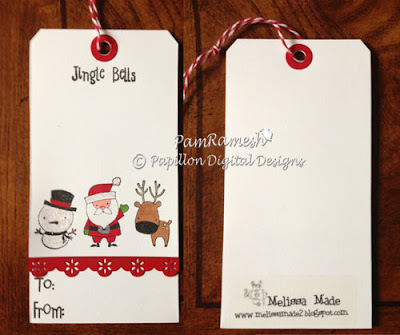 Love the shape of the tag. 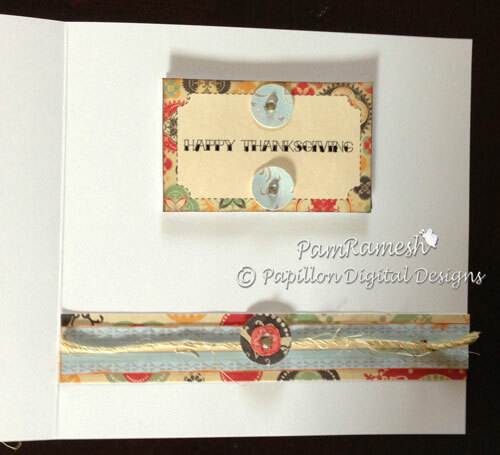 Her layering style is awesome.I still enjoy looking at the card she once sent me. The layering in that was beautiful too. She is such a sweetie. 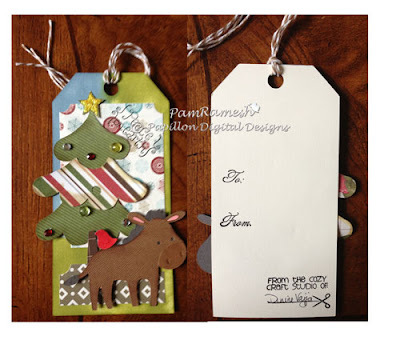 8) Beth aka thunderbirdlindy from http://thunderbirdlindybydesign.blogspot.com/ sent this gorgeous tag. Love the blue color and the way she has attached the fence. That faux rosette is so cute (which I think is from the close to my heart artiste collection if I am not wrong) Awesome! 10) Denine - http://www.pumpkinspiceblog.blogspot.com/ sent this little beauty. Don't you love tree with those different pattern papers . I Love how she has used so many pattern paper but still they look unified! 12) Charlotte from http://alittlebitofdetail.blogspot.com/ sent this cute vintage tag. Love the colors. 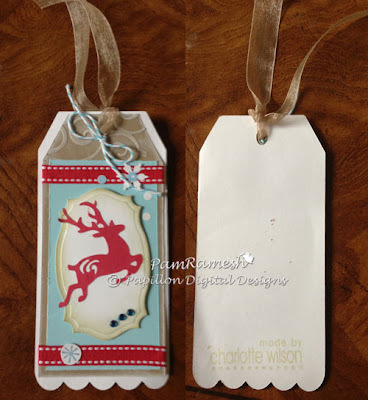 That blue is awesome against the beige/sand color and the reindeer die cut on that cute label with the bling is so perfect! 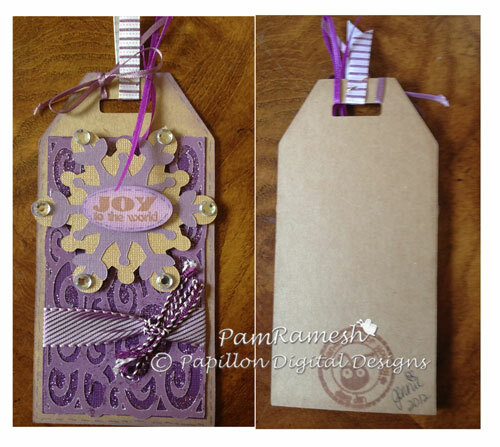 13) And this gorgeous purple colored tag is from Jennie aka Javajen - http://javajencreations.blogspot.com/. Love that shade of violet/purple. The ribbon she has used is so cute! 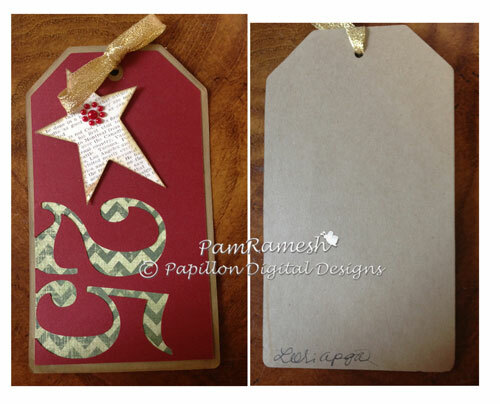 The base is kraft recollection paper. 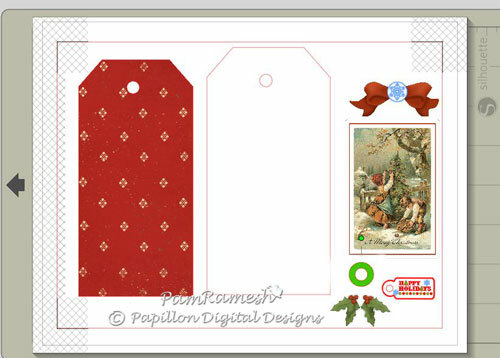 The red pattern paper is a digi paper . The bow and holly and the tag are all cut with silhouette. The ribbon (bordering the tags) is from an Indian roll I had. We generally sew this on to our dress - churidhar or saree blouses. 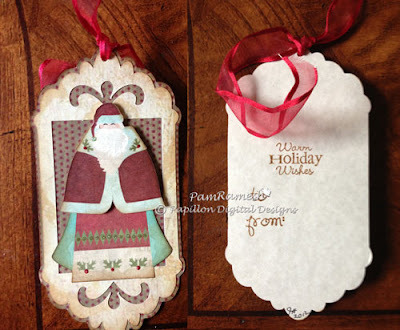 The corner die cut is from spellbinder parisan accents. 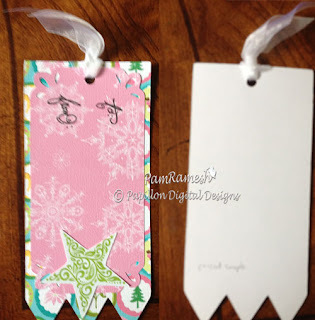 I added the tag and a jingle charm to the white ribbon which is actually eggshell seam binding. I used some pearl spray behind the bow for added embellishment. 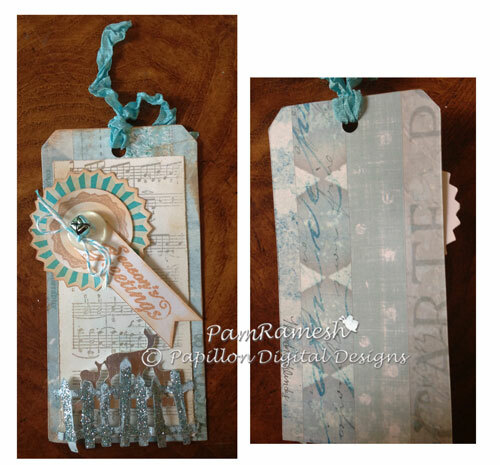 On the back of the tag I stamped a swirl, some lines from a tag stamp and a bit of sentiment - as a note area. 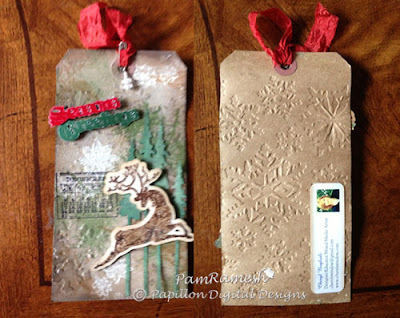 All these were stamped using the tim holtz markers. 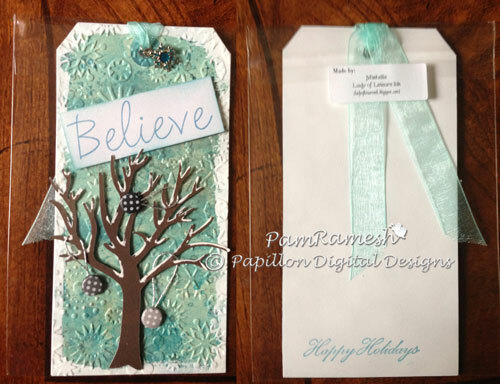 I went over the edges and also some areas inside the stamped area with memento dew drop - platinum. I cut the red paper using the zutter . When cutting bulk this comes in so handy. Then using my big shot pro and sizzix texturz plate from kit 13 - http://www.amazon.com/gp/product/B001GP34SS/ref=ox_ya_os_product I embossed the red cardstock. The snowflake border - isn't that so cute? 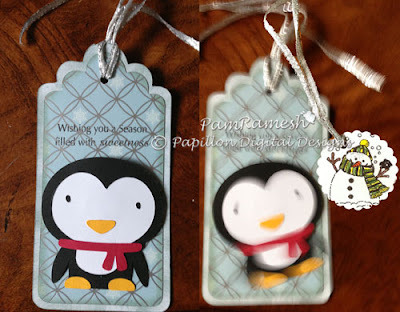 I love it is from memorybox dies which I got from dutchpapercrafts. 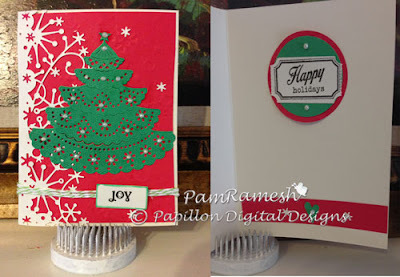 ooh the pretty tree is also from dutchpapercrafts and is a cheerylynn doily tree die I think. Inside of the card I just punched 2 circles with a circle punch and used paper trey ink ticket collection stamp (with the coordinated die) . The Happy holiday part was from another stamp set also from paper trey ink I think. I punched a small heart in green CS using a heart punch and used the left over snowflakes from the border (sift through the die cut confetti before throwing them out lol). 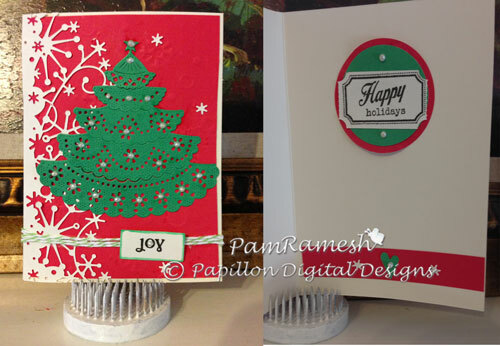 Most of the pearls on the tree and flakes were added using the viva decor liquid pearl. Then I colored using copic markers and added some diamond stickles. Posted by Unknown at 2:58 PM 2 "kind encouraging and inspiring words"
Posted by Unknown at 1:51 PM 4 "kind encouraging and inspiring words"
Adorable, right? 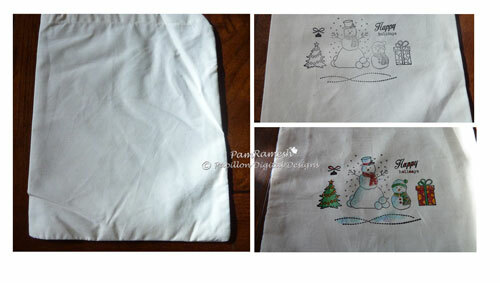 And so simple to make in large quantities for the kids classrooms. I have to admit this is not my own idea, but rather something that I found on Pinterest. Here is a link to the original creator's blog Crafting in the Country. Although I do not have any young kids in school, there are plenty in my neighborhood who will be receiving these next month. I made the whole thing using my Cameo, the reindeer head is a file from the online Silhouette store and the labels are printed from my computer (font Comic Sans.) I changed a couple of things about the reindeer - I used googly eyes and mounted him on an action wobble spring. Here is a look at the back of the label. I purchased the little cellophane bags from Hobby Lobby and inside are 8 Whoppers and 1 red gumball. I can't wait to make a few more of these. Thanks for stopping by today, and as always thank you Pam for having me over to play. 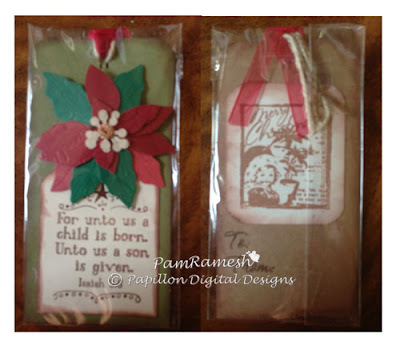 Posted by Michelle at 12:00 AM 9 "kind encouraging and inspiring words"
A Gift Box for cards. Birthday Wishes! 5 years and more!